Ford fails in motion to dismiss carbon monoxide class-action lawsuit for 2016-2017 Ford Explorers. 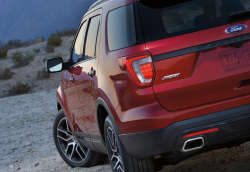 October 28, 2018 — A Ford Explorer carbon monoxide lawsuit won't be dismissed after the plaintiffs adequately pleaded claims the SUVs have defects that allow dangerous exhaust fumes into the cabins. One plaintiff claims he took his Explorer to a dealer after he smelled exhaust fumes in the SUV. The dealer allegedly drove the vehicle and couldn't detect the fumes, so the plaintiff says technicians refused to repair the Explorer. The other two named plaintiffs claim they smelled exhaust odors in the cabins but never took the vehicles to dealers to have the vehicles examined. The Explorer lawsuit alleges occupants are poisoned by their 2016-2017 Ford SUVs because of defects in the HVAC (heating, ventilation and air conditioning) and exhaust systems. According to the plaintiffs, Ford concealed knowledge of the carbon monoxide problems even though dealers were sent technical service bulletins (TSBs) warning of exhaust fumes. Ford issued TSB 12-12-4 in December 2012 about exhaust fume complaints made by owners of 2011-2013 Ford Explorers, then TSB 14-0130 was issued in July 2014 to include 2014-2015 Explorers. The bulletin referred to exhaust and sulfur smells reported when the auxiliary climate control systems were on. Although the bulletins didn't talk about carbon monoxide dangers, the plaintiffs claim the TSBs prove Ford knew the SUVs had problems and that dealers had no idea how to repair the Explorers. The lawsuit alleges the fumes enter the cabins by way of the drain valves in the liftgates and the sheet metal panels and overlaps. In addition, carbon monoxide allegedly reaches occupants through the rear air extractors, auxiliary air conditioning systems and through faulty joints and seams. While Ford was sending attorneys to court, the automaker was answering questions from the National Highway Traffic Safety Administration (NHTSA) about exhaust fumes and carbon monoxide in Explorers used by police departments. NHTSA opened an investigation in 2016 concerning exhaust fumes entering 2011-2015 Explorers and later expanded the investigation following hundreds of complaints. By July 2017, the government had received about 800 complaints about 2011-2017 consumer and police Explorers. Ford tried to convince the judge to dismiss the lawsuit but the judge ruled the class-action can move forward after the automaker's arguments fell through. Ford also urged the judge to dismiss breach of express warranty claims since the plaintiffs did not give Ford mandatory pre-suit written notice according to Pennsylvania law. The law says, “a plaintiff, specifically a buyer, must provide notification of the alleged product defect to the manufacturer prior to bringing suit on a breach-of-warranty theory." However, the judge found under Pennsylvania law the filing of a complaint may constitute sufficient pre-suit notice. Additionally, the judge says a jury should decide whether the plaintiffs gave timely notice of the lawsuit. The plaintiffs also prevailed in their claim concerning violations of express warranties after Ford argued the lawsuit alleges only a design defect which is exempt from the Ford Explorer express warranty. However, while the plaintiffs admit they do allege the vehicles have design defects, the judge says they also allege the exhaust fumes and carbon monoxide could be caused by defects in materials or workmanship. According to the judge, at this stage of the lawsuit the plaintiffs’ allegations are sufficient to allege the exhaust fume problems are covered by the express warranties. In its motion to dismiss, Ford contends implied warranty claims fail because the plaintiffs do not plead the exhaust issues occurred during the warranty period of 3 years/36,000 miles. Again the judge ruled this isn't the case because the plaintiffs claim they suffered from the problems soon after purchasing the Explorers. In a separate issue, Ford told the judge the plaintiffs fail at their breach of implied warranty claims because the plaintiffs never allege the exhaust fume problems render the SUVs “un-merchantable.” But the judge ruled against this argument by saying the Explorers can't be considered safe to sell if they allow carbon monoxide and exhaust fumes into the cabins. Ford further told the judge the plaintiffs shouldn't label the exhaust fumes as a safety hazard, but the judge found at this stage of the case, the plaintiffs only need to plausibly allege the defects impact the safe operation of the SUVs. According to the judge, the plaintiffs did just that. In the end, Judge Terrence G. Berg also ruled against Ford concerning Magnuson-Moss Warranty Act, unjust enrichment, fraudulent concealment and negligent misrepresentation claims. The Ford Explorer carbon monoxide lawsuit was filed in the U.S. District Court for the Eastern District of Michigan, Southern Division - Suresh Persad, et al., v. Ford Motor Company.